1. A young woman walks into a laboratory facility. She has transformed almost every aspect of her life in the span of her last two years. She has quit smoking, been promoted at work and even run a marathon. Neurologists discover that the patterns inside her brain have changed as well. 2. Marketers at Procter & Gamble study videos of how people make their beds. They are attempting to discover ways how to sell a new product called Febreze, which has shown disappointing return in the market. Suddenly, an imperceptible pattern is detected in the habits of people due to which the advertising campaign is designed in other ways and Febreze goes on to become one of the profitable products in the market. 3. One of the largest companies in America is succeeded by a new CEO. His first change in the business is to attacking a single pattern among his employees—how they approach the safety measures — and with that single change the firm, Alcoa, becomes one of the top performing companies in the Dow Jones. What was common in all these people? They focused on patterns that shape our lives and found success. They succeeded by changing certain fundamental habits. 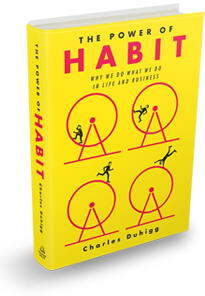 Charles Duhigg is an award winning business reporter of the New York Times and he authored the book The Power of Habit. This book is described in many business blog. In this book he takes us to through thrilling scientific discoveries that show why habits exist and how they can be changed for better. He displays an ability to distill information and present it in the form of engrossing narratives and brings forth a whole new understanding of the human nature and the key to transformation.